Current rally is founded on untrue assumptions. Charts of a number of European ETFs and indices look constructive. The bullish narrative here is very simple. Relative to the US, European stocks are cheap. The US stock market is trading at a CAPE ratio of 29x (the second highest reading in history). This “Cyclically Adjusted Price Earnings” ratio is based on average inflation-adjusted earnings from the previous 10 years. Europe is trading at 18x. European valuations aren’t not cheap on their own, but they’re lower compared to the US. In fact, the ECB is so concerned about the market interpreting its actions as anything but dovish, that it leaked a note the other week (which happened to be on the same day the UK triggered Article 50) that stated markets had grossly misinterpreted its last meeting as too hawkish. 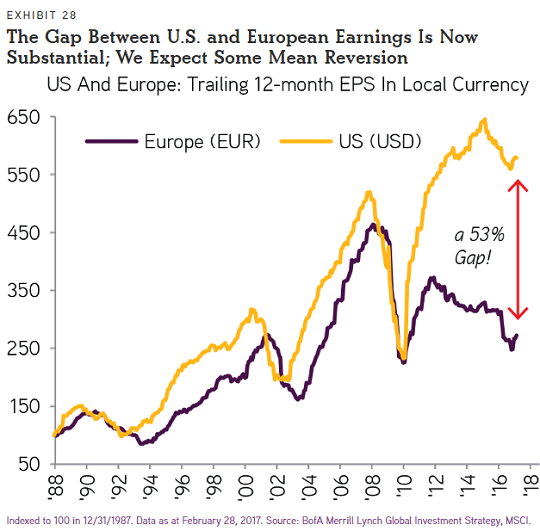 There’s also the assumption that the large earning-per-share gap between US and European stocks will mean revert, with Europe doing most of the heavy lifting to move its EPS higher. There are already signs that this is starting to occur. 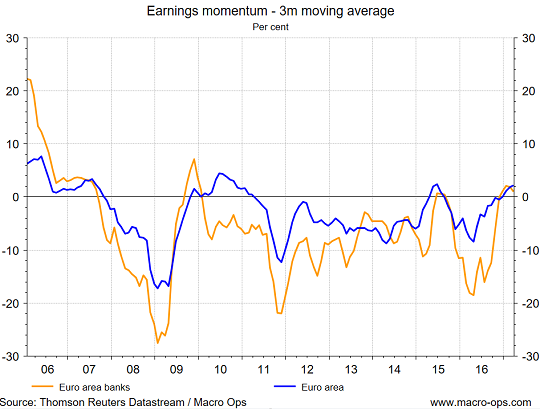 European earnings momentum, as shown by our chart below, recently trended positive for the first time since 2015. How long this trend lasts remains to be seen, but it’s at least a positive for European stocks over the next few months. These factors form the basis of the European bull case: relative valuations, diverging monetary policy, and mean reversion in EPS sets the stage for a run in European stocks. This is why fund managers have been jumping into the trade since the end of last year. A catalyst that would ignite this positive trend further would be the defeat (or the perception of the inevitable defeat) of presidential candidate Marine Le Pen in the upcoming French elections. Le Pen is the populist leader of the right-wing National Front. The National Front is an anti-euro, anti-immigration party. A Le Pen win would send shockwaves across Europe… possibly signaling the demise of the Eurozone as we know it. She’s currently not projected to win. But we all know how well the polls have performed in the last two major political events. Though just like short-term debt cycles oscillate around long-term debt cycles, populist movements oscillate around secular trend lines as well. 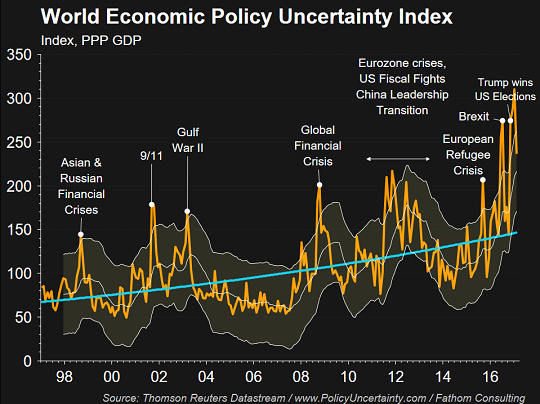 While the long-term populism trend is up (blue line on the chart below), we’re of the mind that we’re near the peak of the current short-term uncertainty cycle (yellow line). We expect political events to swing back towards more predictable outcomes for a while. Le Pen will likely lose. This thought is bolstered by the outcome in the Dutch elections where firebrand Geert Wilders was handily defeated. Le Pen losing would be a positive (however short-lived) for European stocks, because after France comes Germany with a big election in September. It could be a boon to markets if Europe can blanket the flames of populism for the rest of the year. This is also why the ECB is so keen to play it loose. They are an offspring of the EU experiment after all. Based on all this data, it looks like the coast is clear for Europe and we should pile in on the trend, right? The current rally is founded on untrue assumptions and will eventually reverse… hard. None of the original reasons to be bearish on Europe have been settled. None of them. Europe still has structural problems that include inflexible and uncompetitive labor markets, dwindling demographics, a misguided currency union, and an increasingly troubling immigration problem that’s pulling at the seams of their already fragile political union. Europe’s recent “recovery” isn’t so much a recovery as it is another dead cat bounce on its long road of decline. But Soros-style false trends can be powerful moves. And if the French election plays out how we think it will, with Le Pen losing, the false trend will likely continue. By Alex M., Macro Ops. But if history is the guide, you’re on your own. Read… Buy, Sell, or Crash? Fed Warns on Stocks and Look what Happens. The “former” Goldmanites at the ECB, like their counterparts at the Fed and every other central bank, have the sole mission of concentrating all wealth and power in the hands of a corrupt and venal .1% in the financial sector. Meanwhile, the 99% keep losing ground economically and their children face a bleak future as serfs on the incorporated globalist plantation. Le Pen might lose, thanks to sheeple casting votes, but eventually the swindles of the ECB and EU are going to catch up with them and their Ponzi markets and asset bubbles. The $EURUSD, after reaching parity area, will rise for many years. The huge earning gap will narrow & close. stocks, in USD, will give you some protection. Taking dividends, further complicate the calculation. And is that “protection” payable only in funny money fiat? I wouldn’t be involved in any European markets with all the trouble they have and its just going to get worse. Makes Japan look good except for their debt problem and neighbours. Yeah, all those wunderkids had better stock up on that safe haven currency, the Yen, but isn’t North Korea in their neighbourhood? Australia, the wonderful Oz, well it is hiding all of its problems and somebody is intent on keeping the Australia dollar above 75 US cents. Iron ore crashed to under US$70 a tonne last night and good ole Mr. Trump helped send the A$ soaring. Unemployment figures are out today and who knows what they will show. Energy prices are expected to have double digit increases again over the next year which will finally flow though to grocery prices. Energy costs are the 3rd largest cost centre for them after rent and wages. And that nifty boom in real estate prices here also mirrors the change in incomes in the various suburbs. The highest income in the Melbourne area was for Toorak at a little over A$173,000 a year. The lowest was Springvale at around A$36,000 a year. Which area do think has long established Australian families and which one has the most immigrants????? Makes you wonder where to invest your money, doesn’t it. European bonds on the Yankee dollar! Maybe I’m less clued in than your normal readership, but I have no notion of what constitutes a “Soros-style false trend”. Do you mean George Soros? Are you saying he’s made a fortune by managing to bamboozle economic prognosticators? If so, you have to admire the man. Mary, George Soros famously said that the key to amassing his fortune was to bet against unsustainable trends. 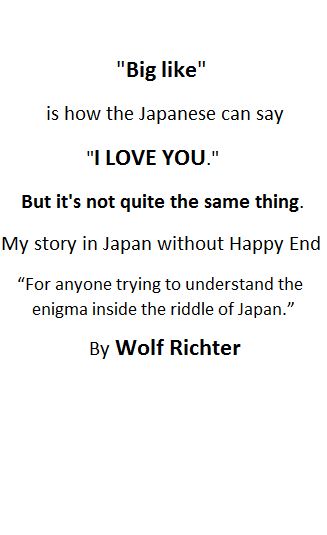 I believe that is what Wolf is referring to. Soros is evil incarnate. I see nothing admirable about the man. Thanks, now I get the reference. I have to laugh when I read stuff like this. Evil incarnate? Soros is the right’s ultimate boogeyman. It’s precious. He is a gin. He blows up countries from the inside out? Le Pen should lose. What is more important is Italy, Spain and France’s parliamentary elections IMHO. Le Pen, like Trump, is a faux populist who will waste no time selling out her supporters if she gets elected. Obviously if you artifically drive interst rates below zero you’re going to have all kinds of false trends. So much of economics is trying to use fancy language and charts to tell simple stories. We have false tyrends in real estate, in ad spending, in health care spending, in retirement benefits… I could go on all night. The fact is, neither the fed nor the ECB created any money between 1996, the end of Glass Steagel and 2008, the financial crisis. Their balance sheets barely budged. Since then, they propped the bond market which is what they said they were going to do. A lot of the Fed and ECB bashing is just antisemitism in drag. This crisis was caused by free trade. It was caused by the unlimited sale of trade notes disguised as T-Bills. How is US fiat currency created? After all is said and done, I have cash in my wallet, checking account, Roth IRA and individual investment portfolio. The Fed uses M1, M2 and M3 for money supply measures. “M2 in the United States has grown along with the economy, rising from $4.6 trillion in January 2000 to $12.8 trillion in June 2016. The supply never shrunk year-over-year at any point in that period. The most extreme growth occurred in September 2001, January 2009 and January 2012, when the rate of M2 expansion topped 10%. These accelerated coincided with recessions and economic weakness, during which expansionary monetary policy was deployed by the central bank (Fed). The Fed has gone from just over $800 billion in fall 2008, to around $4.5 trillion in total assets today. Maybe the Fed propped the bond market, but those assets (correct me if I am wrong) belong the the shareholding banks of the 12 Fed Regional Banks. I reckon the Fed printed money for the banks that own it’s branches, eh? In trade, money is created when US companies (say) sell to chinese companies. Chinese companies can’t use dollars so they trade them with their central banks. Central banks can hold dollars so they buy assets, but since they can’t take risk the buy trasury bills. The problem in 09 was they were buying fannies debt, which was neither short term or guaranteed. So the fed bailed out fannie and freddie. Actually, I get some dividends that are paid to my account in dollars, and I have a cash balance. “Fed bashing” is perfectly legit in a free society. We have to remain free to criticize the Fed. Accusing people who criticize the Fed of antisemitism is a form of censorship with which you’re trying to repress their criticism. “Jew bashing” is antisemitism and is a terrible thing to do, and we all should line up against it. Then how to you explain all the “fiat money” crap. The fact is, the Fed did not create money between 1975 and 2006. Their balance sheet is public. It’s not a secret. Even John Hussman, a huge fed critic pointed it out. The whole gold standard argument is absurd. 99.99% of the business and political world thinks the Fed “creates money” by lending reserves. The fed monetized the debt in 2009 because it felt is had to. Otherwise fanny and freddie debt would have been worthless. Did the fed tell China to buy $1 trillion in Fanny debt? Did it tell Clinton to monetioze all of the US’s manufacturing assets? Did it tell Congress to open free trade agreements with poor countries? The vast vast majority of the world has no clue about how the economic world works. They don’t know how we control it. The US is 100X more powerful than it was even after WW2. We can control countries we don’t even occupy. So, OK, you disagree with the “fiat money” crowd and the gold bugs and those that criticize the Fed for its easy money policies… fine. No problem. That’s cool, OK? But don’t call them “antisemitic” unless they say things that are antisemitic. Absolutely ! Antisemitic is not a word to be used loosely or out of context lest it lose all its meaning . Because there is no rational reason to critisize these so called easy money policies. The easy money wasn’t coming from the Fed, it was coming from the Chinese central bank. How do you think theey ended up with $2.5 trillion in assets. So now, the fed holds 2.5 trillion more than they did in 1007 and the Chinese central bank holds the same and for the fed it’s an “easy money policy” but for the Chinese it’s what? Smarty economics. If somebody can explain to me the difference between the Chinese buying treasuries to financing trade and the fed buying the exact same binds in the exact same market to do the only think they have the power to do, backstop bank failure, and I’ll pay them tuition. Ever read ZeroHedge? They link to Wolfstreet from time to time, so I’m sure you have or do. I do, because once in a while their financial coverage can actually be spot on, although it’s like finding needles in a haystack sometimes. Want vomit-inducing? Go read the comments on any article that is related to markets, central banks, or the economy, and a good portion of the comments are literally blatant anti-Semitism. Anything that so much as mentions the name “Goldman Sachs” turns into a battle of who can spew the most conspiracy-laden anti-Semitism theories out. It’s pretty vile. Doesn’t mean all criticism of the central bankers is, but what he said is true nonetheless, especially among many of the most vocal critics (e.g. the alt-right). Yes, there is a TON of anti-Semitism out there that is trying to get published. I spend part of my day fending off anti-Semitic, racist, and other hateful comments in this comment section. You’d be surprised just how much there is that never sees the light of the day. Some of it is subtle and expressed in code and not easy to catch when you read it quickly and are not familiar with the code (and so I might miss it, and often readers point it out and I can take care of it). Some of it is blatant and easy to catch. I think Paul Schwartzmeyer is referring to these subtle forms of anti-Semitism that are expressed in code and that pop up in a lot of places. But equating criticism of central banks with anti-Semitism is a very dangerous route to go down. It will repress criticism of central banks. Already, the big media outlets are lapdogs of the Fed: They bash presidents and senators with gusto, but they eat out of the Fed’s hands. For example, there is a huge hue and cry in the media in San Francisco and elsewhere about the “Housing Crisis” and housing affordability but none of them ever mention the cause. It’s a no-go zone for the media. It’s sites like this that point out the connection. And it’s important to preserve that freedom to report on the consequences of central-bank policies. But I can’t tolerate stupidity which is envy in drag. If you know something, say it. If I’m wrong, show me where. I love learning. I’ll thank you and pay back the favor. The germans (my grandparents lived in Trier) screwed up. They should have brought in more hews instead of tossing the ones they have. If they did, Berlin would control the world and not New York. Now that my good man is blatant stereotyping on the verge of being anti semitic . It would be, except that the Jews they threw out weren’t foreigners, they were Germans. It was marcus Warburg and John Rockefeller who created IG Farben. Hilter used ansi-semitism as a way to steal it and turn it into a death camp. I had an old frind who’s father bought an industrial cleaning company for a dime on a dollar because the Jew who owned it was forced to sell. The Jews, like every other race, were clannish. After WW2 ended, Europe became MORE racially segregated. The last internment camps, in Suria, were closed during the Kennedy administration. Also, to say one race is racist is not to say another race isn’t. There are seven Jews on the fed, The fed has been wrong, I think the number is 87% of the time. There isn’t a black man or an Italian smart enough to be wrong 87% of the time? haha. In fact, Senator Menendez grilled Yellen on that. How does pointing out the pernicious role and activities of the Fed or central banks make one an anti-Semite? Please elaborate, Swartzmeyer. There is no pernishous role of the Fed. They are doing exactly what they were put ther to do. Bail out the banks. First a little info . A juggler juggling three to five balls can afford to drop a ball easily recovering it and continuing on . But once the magic number five is exceeded the odds of recovery decrease with the odds of total failure [ dropping all the balls ] increases . Beyond ten balls and recovery becomes all but impossible . What the Fed ECB et al in fact all economies across the globe are beginning to look like in my opinion is a juggler trying to keep forty balls or more in the air .. each one set to explode the minute it hits the ground … with needle sharp spikes gradually growing out of the balls threatening to pierce the jugglers hands as he juggles them . Begging the question : how soon till the juggler drops all the balls … and how bad will the consequences be once he does ? Or alternatively …. are the balls and the juggler a mere illusion and the whole thing is nothing more than a shell game intending to distract us ? THAT Picture is great! The “juggler” really describes the situation of CBs: they might have started easily with three to four balls – and then taken up another after another – and now they do not know how to unload and finish the show…. “Cyclically Adjusted Price Earnings” — That is the so-called Schiller P/E, right? While I agree it is very high for the US, I’m not sure that the European value being lower is truly a good sign for Europe or European stocks. When I was much younger I used to listen in fascination to the old stories of how hard the depression had been. Overseas bonds as our friends use less dollars!